During a two-day weekend excursion, students and staff from easyMandarin visited the beautiful San Shan Island located off the coast of Lake Tai (Chinese: ? ?, pinyin: “Tài hú” in pinyin, literally “Grande Lake”), one of the biggest lakes in China. The diverse group took a speed boat to the island where motor vehicles are not allowed and everyone rides bicycles or electric bikes to get around. 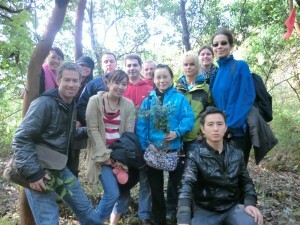 The action packed trip included mountain hiking, bike riding, and touring of the ancient town. Additionally, the group took a fishing boat around the islands to admire the awesome natural scenery. Students practiced their Chinese with local farmers, and enjoyed hearing about folklore while picking juicy tangerines off the trees and eating them. To top it off, the evening included a barbecue and camp fire (roasted marshmallows! ), along with singing Chinese and Western songs! For pictures of the trip please click here – easyMandarin Chinese School Visits Suzhou’s San Shan Island.